The sun hasn’t been out here in the Tri-State since our picture perfect 67 degree day this past Sunday. While we’ve had mild temperatures, we have been dealing with clouds, fog and heavy rainfall. Will remain quite active over the next 24 to 36 hours as we deal with two potential severe weather threats. One this evening and the other tomorrow morning – afternoon. Warm front over the southern portions of the Tri-State is leaving us with quite the temperature gradient, 40s to the north 50s and 60s south of the Ohio River. Showers and a few storms are possible through the afternoon. But the window for severe weather is this evening, with the greatest chance of severe storms across southwestern areas of the region. Southern Illinois, and SW Kentucky. Those areas are under a “Slight” risk and the rest of the region is under a “Marginal” risk by the Storm Prediction Center. 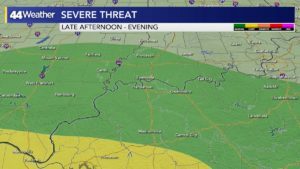 Primary threats are damaging winds and a few isolated brief tornadoes. Showers and storms will continue through the overnight as temperatures rise as the warm front lifts through the entire area. Temperatures will rise from the mid to upper 50s through the low to mid 60s by daybreak Thursday. A cold front will be pushing closer to the Tri-State tomorrow afternoon, rainfall will intensify late morning through the afternoon. 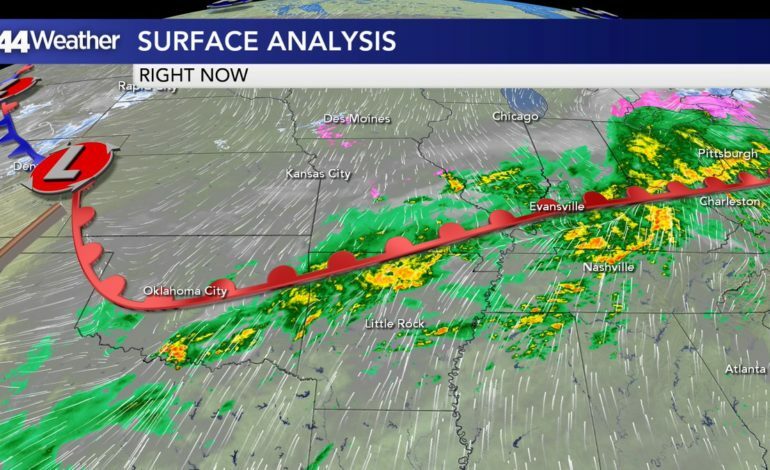 That is the best window to see any kind of severe weather, with again, damaging winds being the primary threats with a few isolated tornadoes. 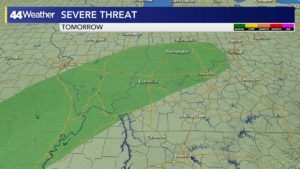 SPC has placed the Tri-State under a “Marginal” risk. 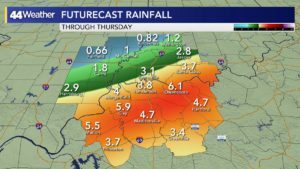 Parts of the Tri-State have already seen 1″ to nearly 2″ of rainfall, with more to come through Thursday afternoon. 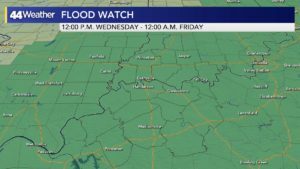 Flood Watch remains in effect from Noon – 12 a.m for the entire area. 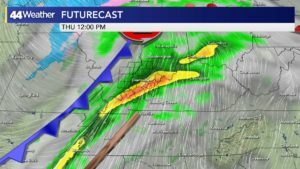 Total rainfall totals will be 2-4″ with locally higher amounts of 5″ to 6″ possible. Old man winter makes a return late Thursday-Friday, we’re not talking about any subzero temperatures but you will feel the chill Friday. 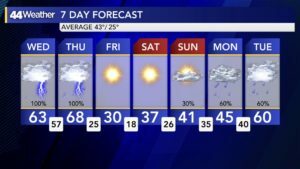 Temperatures will crash into the 20s and 30s and by Saturday morning will likely see temperatures in the Teens.